Pursuing a career as a Video Game Designer means you’re ready to be an essential production member of a successful game. Generally, designers conceive of and describe every element of the game. This enables the rest of the team to do their parts to make the game a reality. Creative and vibrant places to work, video game studios have different hierarchies and nomenclatures to describe what members of the game development team do. Regardless of what people label them, roles for video game designers generally fall in to these categories: lead designer, content designer, game mechanic designer, level designer and writer. Video game designers work in both large and small studios – and sometimes as independent contractors – to do their jobs. Sometimes they wear multiple hats. A lead designer might also be the game mechanic designer. Game creation is complex, creative and technical. It’s fast moving and always changing. A job in the video game industry may not look or feel the same week to week. Video game designers often work long hours and on tight deadlines. Much of their work is at a computer. Game designers must be able to work both independently and as part of a team. The first, and absolutely necessary, requirement for being a successful video game designer is passion. In a competitive, fast-paced, highly technical profession such as producing video games, real and abiding passion for video games is a must. Additionally, a video game designer will need some hard skills. Depending on the design role played, these skills can include graphic design, content development, and deep knowledge of design computer applications. A background in programming and knowledge of scripting languages (for example Lua and Python) helps designers work most effectively with programmers. While there are no hard and fast educational requirements to become a video game designer, a college degree in certain disciplines may help open doors at larger studios. Bachelor degrees to consider pursuing are game design, game development or computer science. Gaining experience in any video game development role can help a designer get a foot in the door. A real and solid knowledge of how video games work, what makes them great and what flaws they have, is necessary to design new games. Discovering a passion for a particular type of game may provide some useful career direction. Even if a designer’s work is only in concept, and he or she has never used it to release a fully developed game, being able to show a portfolio of work demonstrates creativity, aptitude, technical skills, and passion. Many people perceive game design to be glamorous. As a result, hiring managers receive a flood of applicants. Applicants who demonstrate solid commitment, dedication and skills stand out. This includes scripting and design applications. The more a candidate knows and can demonstrate solid proficiency for, the more appealing they are as a hire. A degree in game design, game development or computer science is appealing to game developers. While not required to become a designer, a degree implies a deeper industry knowledge and commitment. Breaking into a competitive industry, such as video game design, may mean taking any role just to get a foot in the door. Prepare to take jobs that don’t require advanced skill sets. Demonstrate an eagerness to be a part of the team in any way possible. In this fast changing industry, it’s important to keep a portfolio that is fresh and interesting. Lead Designers often take a management role, supervising the rest of the design team’s work. They are also tasked with orchestrating the design team’s concepts into a unified game document. Essentially, this can be a combination script, production guide and storyboard. Content Designers are responsible for characters and game plot. They are responsible for continuity, ensuring that all the objects in a game are suitable for the game’s environment. A simple example: in a jousting game, game start might be indicated by a horn, bell or crier, but not something of more recent vintage such as a buzzer. Content Designers often work on the game in pre-production, but have important roles during development as well. They must edit and adjust content for continuity as the game changes in pre-production. Game Mechanic Designers focus on a specific element of the game. Their tasks depend on the type of game under production. For example, in a car racing game, game mechanic designers might plan and document how the racing vehicles function. In the jousting game example, the content designer might be examining stop motion photos of horses running to determine how they will move in the game, as well as the function of lances and armor. Level Designers create the ambience of the game, the entire environment of the game. Some game elements are obvious. For a simple example, a game featuring the character Dora, would have a look and feel that reflects the television show. Colors are bright and clear, shapes are simple. Drawings of features (like the snowy mountain) look a little like map features. In contrast, the ambience of a vampire video game might be darker, more brooding. Level designers go deep in to tone. Their choices set the mood for the game, greatly affecting player experience. Writers handle the text and dialogue in the game. Their role also varies greatly depending on genre. Like content designers, a writer typically will have more to do working on a role playing game than a puzzle game. What Does an Average Day Look Like For A Video Game Designer? Video game designers might work at large or small studios. They may work onsite or at their homes, depending on employer preferences and their own status. Designers engage in the creative process of articulating their designs specific to a game. Sometimes this can mean creating guidelines for extant characters or a game plan (for example, a super hero game based on a comic book). Other times the designer is challenged to come up with multiple concepts for rendering elements of the game, giving producers options for look, feel and function. This is an exciting process for most designers; time flies and designers are fully absorbed in the creative process. Whatever role a designer is playing – lead, content, game mechanics, level design, writing – an essential part of the job is carefully and precisely documenting their game element design. The better the design and documentation for it, the better programmers can code it. During production, designers are responsible for working with programmers to ensure that what is delivered is right. What they are working on will vary based on their role. For example, the content designer is going to worry about different elements from the game mechanic designer. This can require back and forth, and sometimes leads to exciting developments. Video game production is collaborative and requires many people. Meetings are used to efficiently ensure teams have the same information and are working according to the same game plan and goals. Video game designer work is computer-intensive. Applications might be called upon to use various scripting languages and all advanced graphic design software, such as Adobe Creative Cloud, Adobe Encore, After Effects, Autodesk Maya, Flash, Illustrator, Photoshop, SketchUp Pro, Unity, ZBrush. Are You Suited for A Career As A Video Game Designer? Being passionate about playing and designing video games is a must. It can’t be faked and it will be tested by potential employers. Video game designers are expected to acquire technical skills necessary to operate various design and scripting applications. They don’t have to operate at a programmer level, but they need to be able to communicate effectively with programmers. Designers are essentially creative professionals. They are interested in and passionate about design. Video game designers must be self-driven. On game development teams, they’re expected to jump in, work the same hours as the rest of the team, and fully engage in their design responsibilities. In a game development team, feedback is not always positive and feelings can run high. Game design is an art, which can make criticism feel personal. Successful designers are able to work with the team to make changes, as they are needed, and stay focused on the end goals. Some video game designers are well paid but many are not. Additionally, there is a lot of competition for modestly-paid postitions. Becoming a video game designer is more about excitement for the work than the paycheck. Knowledge of other desktop design applications. For example, 3D modeling programs. Animation Career Review also lists USC as a top school for game design and development, followed by Carnegie Mellon, Savannah College of Art and Design, Rochester Institute of Technology, Parsons The New School for Design, Columbia College Chicago, New York University, Cornell, and University of Pennsylvania. How Does A Video Game Designer Find Work? Use gaming websites, job sites, interest groups boards, forums and any other available online and social media hubs to locate job postings and connect with people already in the industry. Volunteer to be a tester. Ask for coaching and guidance on breaking in. Set up a portfolio page on professional social media sites. Find ways to contribute to the industry by writing reviews, volunteering at industry events, volunteering to moderate boards or anything similar. Design a game, even a simple one. Maintain an ever-growing portfolio of video game related work. This helps demonstrate talent and passion. Consider designing several games that show different design strengths. These can be very small games or even suggested modifications to existing games. The goal is showcasing talent. Amassing technical skills can help secure an entry-level position as technical part of the video game development team. Continually building a portfolio of game design related work demonstrates talent. What is the Average Salary of a Video Game Designer? The Bureau of Labor Statistics (BLS) estimates workers in the video game production profession exceed the national median annual wage of $33,840. However, the BLS does not track the video game industry separately. Wages can vary greatly depending on employer, portfolio, role and location. BLS cites Game Developer Magazine as having a higher estimate, with wages ranging from $49,000 for QA testers to $107,000 for business management staff. According to Game Developer, designers averaged $68,000 in salary. Recruiter.com estimates a range of $40,000-$90,000 in annual salary. According to Recruiter.com, video game development jobs have the highest average income in Washington, Illinois, Rhode Island, Connecticut, New York, Virginia and North Carolina ($53,950-$70,360). Software development jobs are expected to grow 24% from 2016 – 2026. As a related industry, this may be a useful number to predict growth. 24% is a much faster growth rate than other occupations generally. The Entertainment Software Association (ESA) views video gaming as a robust industry, generating more than $30 billion in revenue in 2016. The ESA estimates that the video gaming industry employs more than 220,000 people in 50 states (however, this estimate includes both direct and indirect employment). As technology enables designers the ability to produce richer, more complex and sophisticated games, demand appears to continue to grow (the ESA estimates that 60% of the U.S. population plays video games). Games are viewed not only as entertainment, but also as educational tools. Note: these are U.S. numbers however, video gaming is an international industry and opportunities cross borders. Video game designers can come into the industry right from college or as soon as they can get any job or internship within the industry. Because of the competitive nature of the business, it is wise to get into the industry as soon as possible, developing skills and a portfolio. Technical skills, as well as expertise in design, content development, writing or game mechanics will also help secure work. Video game designers may find employment as full-time employees, but some studio business models rely on independent contractors, so designers should be prepared to work either way. The Entertainment Software Association (ESA) has general industry information including publisher directories, advocacy and industry outlook data. The Graphic Artists Guild’s goal is to help members build successful careers, and this can include video game designers. The website includes sample digital contracts, general industry information and some job listings. The International Game Developers Association (IDGA) serves all individuals who create games. Its mission is to advance the careers of game developers. IDGA hosts conferences and smaller events. 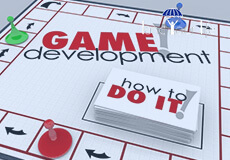 For example, on the fourth Wednesday of each month, IDGA offers a webinar on game design. The Academy of Arts & Sciences (AIAS) focuses on the advancement of interactive entertainment industry. The Entertainment Software Rating Board (ESRB) assigns age and content ratings for video games and mobile apps, enforcing marketing and advertising guidelines. Though ESRB is a consumer advocacy organization, video game designers should be familiar with their guidelines and policies. Special Interest Group on Computer-Human Interactions (SIGCHI) focuses on the ways humans interact with technology. With chapters across the world, SIGCHI may offer networking opportunities. For networking, look for regional gaming organizations, such as Oregon Games Organization (OGO), a group dedicated to making Oregon a hub of video game development. Popular game design blogs include Terra Nova, Gamasutra Expert Blogs, Mobile Dev Memo and Games Brief. Video game publications include IndieGame, Dev.Mag, International Journal of Computer Games Technology, Game Studies, and Game Informer. Note: Game Developer Magazine closed in 2013 but is archived online. Game design experts are also tweeting. Some to follow on Twitter include Brenda Romero and Game Design Expo. Prospective video game designers can learn some game design, programming and theory from open game design courseware. Providers include Coursera (Gamification, Video Games and Learning) and MIT (Game Design).